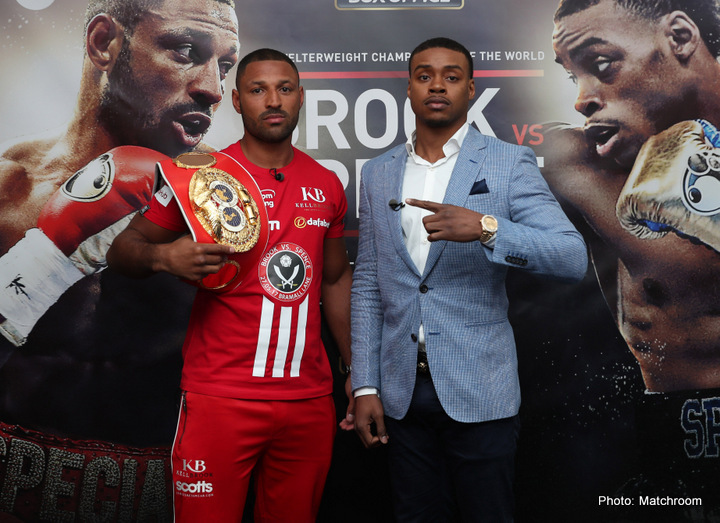 Unbeaten Errol Spence Jr. (21-0, 18 KOs) sees IBF welterweight champion Kell “Special K” Brook (36-1, 25 KOs) as a road bump on his path to becoming a boxing great. The two fighters will be facing each other this Saturday night on May 27 at Bramall Lane in Sheffield, England. Spence is the younger fighter at 27, and he’s coming into the fight with a lot of hype behind him, as he’s seen by a lot of people as the replacement for Floyd Mayweather Jr. and the next superstar for the 147 pound division. Spence has trained with Mayweather in the past, and he gave him a lot of problems in sparring. Mayweather recognized how good Spence is from the sparring they did, and he’s been saying positive stuff about him ever since. 2012 U.S Olympian Spence reportedly hurt Broner during their sparring session. It happened a long time ago when Spence was still an amateur fighter. For Spence to hurt Broner, it shows you what kind of punching power he has going for him. There are lots of question marks surrounding the 31-year-old Brook going into this Saturday’s fight with Spence. One of the question marks is Brook’s surgically repaired right eye. Brook suffered a broken right eye socket in his last fight against IBF/IBO/WBA/WBC middleweight champion Gennady “GGG” Golovkin last September in an ill-advised fight. Brook went up 2 divisions to take the fight with the stronger and bigger Golovkin. It’s possible that Brook was influenced by what Amir Khan had done earlier in the year in moving up 2 weight classes to fight then WBC middleweight champion Saul Canelo Alvarez at a 155 pound catch-weight. The move for Khan ended in disaster with him being knocked cold by a right hand from Canelo. Likewise, Brook’s decision to move up 2 weight classes to fight Golovkin at the full weight for the middleweight division turned out to be a disaster for him as well. Brook was stopped on his feet in the 5th round by GGG after he had suffered a broken right eye socket. Brook’s trainer Dominic Ingle three in the towel after he had seen enough of watching Brook get pummeled by Golovkin in the 5th. Brook didn’t view the loss to Golovkin as a negative. On the contrary, Brook has been talking up the fight ever since, saying that he created the blue print in how to fight – and get the better – of Golovkin. No one has actually beaten Golovkin, so you have to take what Brook says with a grain of salt. Brook did fight well in the 2nd round against Golovkin, but that round was the full extent of the positives from that fight for him. Brook’s right eye required surgery after his loss to GGG to repair a broken right eye socket. We still don’t know yet how that eye will do under fight conditions. Brook has said that it will hold up because he’s tested it with sparring. But sparring is not the same thing as fighting, so we’ll see on Saturday if Brook’s right eye will be able to handle Spence’s big shots. Brook’s trainer Dominic Ingle will surely pull him out of the fight if it looks like he’s having problems with his eye. The other thing that Brook has to worry about is his weight. He’s had to lose a lot of weight to get down to 147. Brook says he’s going to make the weight for the fight, but we don’t know how strong he’ll be. In the video of Brook working out for the fight, he looks very cut up. You don’t see much fat on him at all. That’s a product of the lean diet that Brook has used to shed the fat that he put on after the Golovkin fight. Unfortunately, Brook might end up too weak to fight at a high level for the Spence fight. This isn’t the type of opponent that Brook can come into the contest at only 80%. He’s going to need to be 110% to beat Spence on Saturday, and he may not be able to do that. Spence wants to beat Brook and then take his IBF title to use it as bait to get WBA/WBC champion Keith Thurman to fight him. If Spence can beat Thurman, he would be the man at 147. The only other belt not in his possession would be the WBO title held by Manny Pacquiao. Spence would obviously like to get a shot at that title to, but it might not ever happen. Pacquiao’s promoter Bob Arum will likely keep him off to the side until he defends his WBO title against fellow Top Rank fighter Terence Crawford. If Crawford can take the WBO title from Pacquiao, then he might get the green light to face Spence. This is guesswork for the future. Spence will need to beat Brook on Saturday for him to have a chance of doing anything special in the division. It would be a big disappointment for Spence and his boxing fans if he loses to Brook. The fight is considered a 50-50 affair. Brook seems to find a way to win. Brook came to the U.S and beat Shawn Porter in his own backyard in 2014. Brook will be the home fighter on Saturday in fighting in front of his fans in Sheffield at Bramall Lane. It means that Brook will be fighting at a high level for as long as the fight lasts. It also could mean that any rounds that are close could wind up being scored for Brook. Spence is counting on the judges doing their job in a fair manner by giving them to the better man. But it would still be in Spence’s best interest to make sure the fight with Brook isn’t close and doesn’t go to the scorecards if he wants to take his IBF title from him.